I remember the first cookbook I bought – I was a teenager on a summer vacation in Hong Kong. Browsing in a bookstore, I picked up a Chinese pastries cookbook. In fact, I still have that book, sometimes I’d make the steamed buns recipe. That was how my love for cookbooks started, my collection continues multiply, especially in the past few years as I started blogging. I was very excited to receive a review copy of Dorie Greenspan’s Baking Chez Moi. As you would have guessed by now, my favourite cookbooks are about baking. Dorie Greenspan has written award-winning cookbooks on baking and French cooking. Baking Chez Moi is her latest book on French baking. It is divided into 5 sections, from simple cakes to frozen desserts. It really covers many great French baking recipes that can be easily done at home. 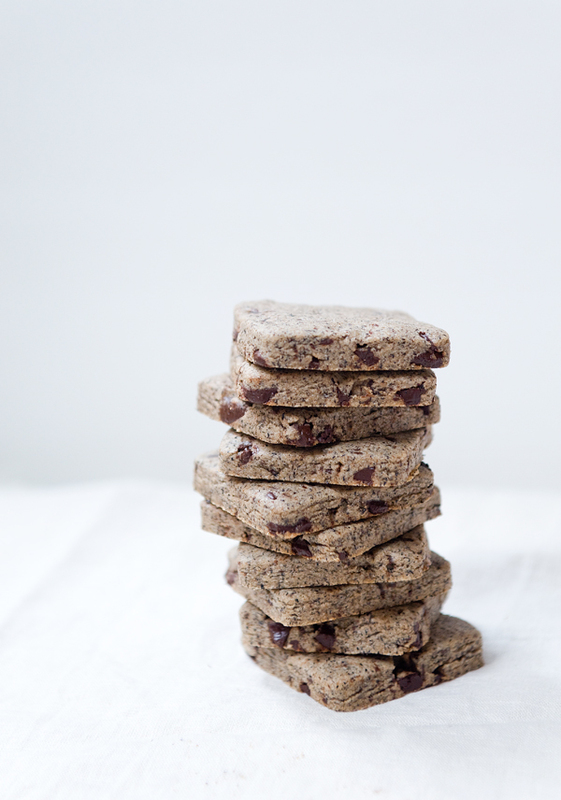 One of the recipes that caught my attention was the Toasted Buckwheat and Chopped Chocolate Sablés. 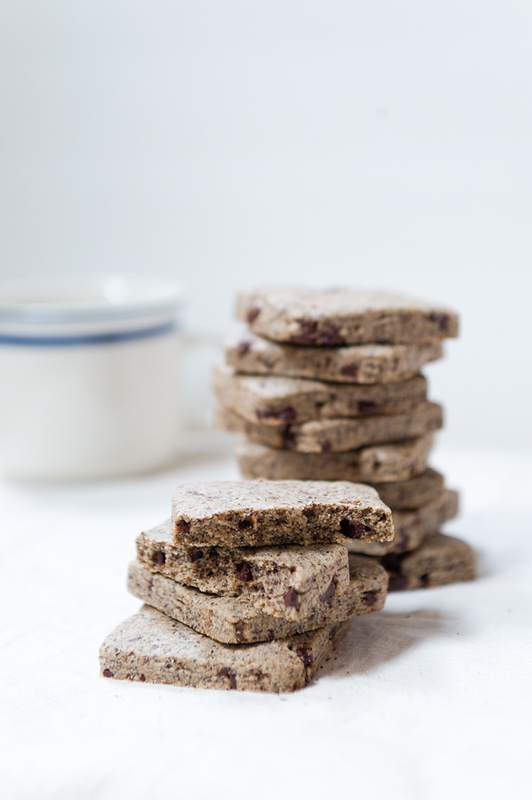 The idea of toasting buckwheat flour is great, as it intensifies its heartiness and adds a nutty flavour to it. Center a rack in the oven and preheat the oven to 350 degrees F. Line a baking sheet with parchment paper of a silicone baking mat. Spread the buckwheat flour out on the baking sheet, leaving a border of a few inches bare. Toast the flour for 5 minutes, then stir it with a table knife or a heatproof spatula. Continue to toast the flour, stirring every 5 minutes, for another 15-20 minutes. The flour is ready when it is a darker shade of beige and fragrant; it might even smoke around the edges. Let it cool to room temperature. Turn off the oven; you won't need it for a while. Measure a cup of the cooled buckwheat flour into a medium bowl and add the all-purpose flour; whisk to blend. Working in the bowl of a stand mixer fitted with the paddle attachment, or in a large bowl with a hand mixer, beat the butter at medium speed until it is soft and creamy. Add the sugar and salt and beat for another 2 minutes, or until the mixture is again smooth and creamy. Add the egg and beat for 1 minute more. The mixture may curdle; if it does, beat for another few seconds, and it that doesn't undo the curdling, adding the dry ingredients will. Reduce the mixer speed to low and add the flours in 2 or 3 additions, mixing until they disappear into the dough. Add the chopped chocolate and pulse the mixer on and off several times to incorporate it. Or, if you'd prefer, use a flexible spatula to stir the chocolate into the dough. Turn the dough out onto a work surface and knead it gently, just so that it comes together. Divide the dough in half. Working with half of the dough at a time, put the dough between two sheets of parchment or wax paper and roll until it is 1/4 inch thick. (Check for thickness, not shape.) Slide the dough, still between the papers, onto a cutting board or cookie sheet. Slide the second piece of dough on top of the first and put the dough in the freezer to firm for about 1 hour. Alternatively, you can refrigerate the dough for several hours (or for up to two days). When you are ready to bake: Position the racks to divide the oven into thirds and preheat the oven to 350 degrees F. Line two baking sheets with parchment paper or silicone mats. I like to use to a 1-3/4 inch round cutter for the cookies, but you can use whatever you like, knowing that your yield and perhaps your baking time will change depending on the size of your cutter. Cut out as many cookies as you can from the first piece of dough and put them on a baking sheet, leaving an inch or so between. Keep the cookies in the fridge or in a cook spot while you cut cookies from the second piece of dough. Combine the scraps, put them between two sheets of parchment or wax paper and roll out until it is 1/4 inch thick; chill before cutting and baking. Bake the cookies for 13-15 minutes, rotating the sheets from top to bottom and front to back at the midway point. Remove the baking sheets from the oven and let the cookies rest on the sheets for a few minutes, then transfer them to rack to cool to room temperature. Recipe excerpted from Baking Chez Moi, Dorie Greenspan, 2014, Rux Martin/Houghton Mifflin Harcourt. This hearty sablé is great with coffee or tea. I used a 80% cocoa dark chocolate, it has a smokey flavour, which works well with the toasted buckwheat. Good ideas for this recipes as suggested in the book: toasted flour sablés and toasted flour or buckwheat sablé sandwich cookies. The Bonne Idée section of some of the recipes is my favourite of the cookbook, it provides the different variations of the recipes you can make, or make another dessert out of the same recipe. The storage information on each recipe is also very helpful because always freeze my cookie doughs so I can bake them fresh whenever I want some freshly baked cookies. Next time, I might try using a different flour in place of the buckwheat for my own little experiment.